Birth and Death records in the State of Michigan began around January of 1867; however, these were in no manner enforced. It may very well be that you have a Michigan Ancestor that you know was born or died in Michigan around 1870 but can’t locate a death record. This may be because one was never filed. Same with birth registries. I don’t know on how many occasions I have searched for a birth record only to find nothing. Don’t be alarmed if this happens to you. There are substitutes you can use for similar information. If you can’t find a birth record look for the death record instead. Most death records list the date of birth even though this information is a secondary source. What do I mean by this? A primary source is a document that was completed at or near the time the event took place. A birth record is a primary source because it was completed by the parents or the doctor of the newborn who knew the information firsthand, therefore it is considered accurate. A death certificate or record is considered a primary source only for the information surrounding the decedent’s death. While birth information is found on a death document it is not primary information, meaning the informant was not present at the time of the decedent’s birth. Rather, the informant recalled the birth information based on what they then remembered (or was told). Still, if a birth record is lacking… sometimes this is all you can rely on. Use the information but remember it may be in error. Try to find other sources to back the information. Other sources that may assist in finding missing birth or death information include obituaries, bible records, church records, cemeteries, naturalization/citizenship records, and perhaps military records if the individual was a veteran. Obituaries as we know them were not frequently published until the early 20th century. Early obituaries are few in number and may only contain a brief quip… “so and so died yesterday… funeral held from home” etc. Search local newspapers closest to the decedent’s final residence for your best chance of finding an obituary. Some local newspapers (and I am referring to the small neighborhood papers) wrote lengthy biographies of each decedent… very helpful. You won’t find these online for the most part as there isn’t much of a market (the larger firms won’t waste their time seeing they can’t make much money from them). If you are fortunate enough to find a Family Bible you may find listed handwritten birth/death information. This too is considered secondary information and while you would think the information to be error-free, I have found the information on numerous times to be in error. So just keep this in mind. Again, try to back up any information you find (that is not primary) with other source documents. Church records too are good sources for birth and death information if these were published. Many churches registered births as they practiced infant christening. And many membership records note when a member died listing the date. Not all churches kept meticulous records so you will have to research each church body, call and ask questions of similar churches. Then there are cemeteries. You would think that a tombstone listing birth and death dates would be accurate, right? Not always. I have an ancestor whose death certificate, obituary, and tombstone all give different birth years. It happens. Perhaps no-one really knew when a person was born. They were relying on what that individual told them during his/her life. And that information may have been less than accurate. Our Ancestors didn’t place such a high importance on birthdays as we do now. In some instances, they didn’t know when they were born. So, keep this in mind when recording information from a tombstone marker. Naturalization records (post-1906) will list biographical information that you may find useful. Early immigration documents do not record much information. If your Ancestor was a veteran seek out his military records: enlistment paper and/or his pension record. These documents often contain a plethora of vital information (children born, date of birth, residence(s), etc.) Worth the expense in obtaining. 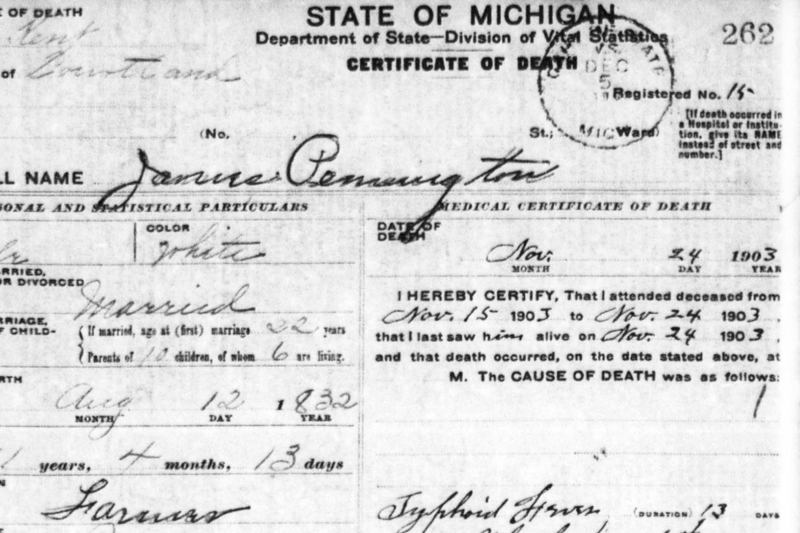 Death certificates held by the State of Michigan Archives are being scanned and digitally uploaded at seekingmichigan.org free of charge. The records come in three sets: 1897-1920 (completed); 1921-1947 (nearly completed); 1948-1952 (being worked on). There are plans on digitizing Naturalization records soon. 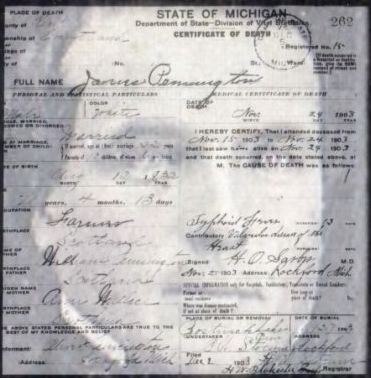 Birth records must be sought out from the Michigan County where the event took place (if filed). So, don’t get frustrated if you can’t find that elusive early birth or death document as there are other sources you can find that will contain the same information. I have utilized these other sources to fulfill lacking information on numerous occasions. While considered secondary information it is all you have to go on sometimes. Always try to back non-primary information up with at least two other sources – if possible.